Are you ready for October ball? Anybody else out there excited about baseball? Bart and I were both baseball fans growing up, and when we got married and lived in Denver near our first local major league team, we decided it would be fun to renew our interest in the sport since we had a franchise so close. The Colorado Rockies weren’t all that great, except for their amazing late season run to the World Series in 2007, but it was still really fun to keep up with the players, listen to games on TV or the radio, and go to games. Naturally, when we moved to the east coast, we had to decide where to place our allegiance, and while we still generally wish the Rockies well from afar, we have chosen to “root, root, root for the home team,” the Washington Nationals. And so far in 2014, that is going pretty well for us. Happy first day of fall! Historically, this is my favorite time of year–changing leaves, cooler weather, tasty food, and, most importantly, my birthday! In recent years, however, fall has unfortunately transformed into an unwelcome reminder of the upcoming cold and bitter winter, and for a while I lost quite a bit of the joy and excitement I originally had about it. However, I’ve decided that I don’t want my favorite season to be ruined for me anymore, so I’m on a mission to reclaim fall. Have I mentioned how many trees we have in our yard? 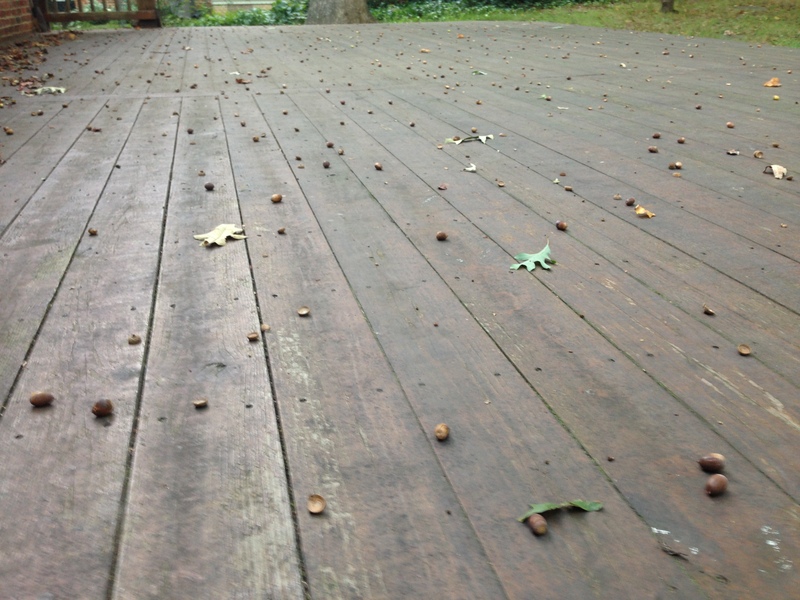 Apparently a ton of them are oak trees, because for the last few weeks, it has been raining acorns around our house. And I just swept the deck a few days ago. A year ago we went under contract on our house and were doing things like paperwork, home inspections, and furiously packing. Now, eleven months into living in our new home, we’ve moved on to completely ripping apart our prized investment, but hopefully for a good cause. They say you can’t go home again, but this week I tried. I had a work meeting that took me to my old stomping grounds near Boulder. This was my first trip back to Colorado since we moved almost two years ago, and I wasn’t quite sure what to expect going back to a place I called home for over eight years. I’m not going to sugar-coat the facts, folks: I’ve played way more than my fair share of Candy Crush in the last year. I downloaded it out of curiosity, then found myself playing it nearly every time I sat down with my phone. I used it to pass the time when idly waiting for something. I used it as an excuse to sit down and not do anything when I was feeling tired and unmotivated. I used it to soothe myself when I was feeling sad or discouraged. I would go through spurts–sometimes I would play it less if I finally caught up with levels and was waiting for a new update. Sometimes I would play it more, striving to get to the current end as fast as I could so I felt accomplished. But I played it a lot. Very much a lot. But all that changed a couple of weeks ago, when I finally crushed the candies for good. I am often inspired to bring a taste of my travels home by recreating some of the new foods I try in my own kitchen. During our trip to Switzerland, I noted a couple of dishes we enjoyed that I wanted to try here, so this week while making my meal plan, I decided it would be a great time to tackle one.